It's always tempting to hide clutter behind things - like in UI, to tuck stuff behind a drop down. But even on mobile: don't do that. There's an argument that navigation options should always be visible. It sometimes strikes me as weird that the first half of the '00s didn't have Youtube - this history of Youtube touches on that dark era, and generally does a good job painting the broad strokes of its evolution. 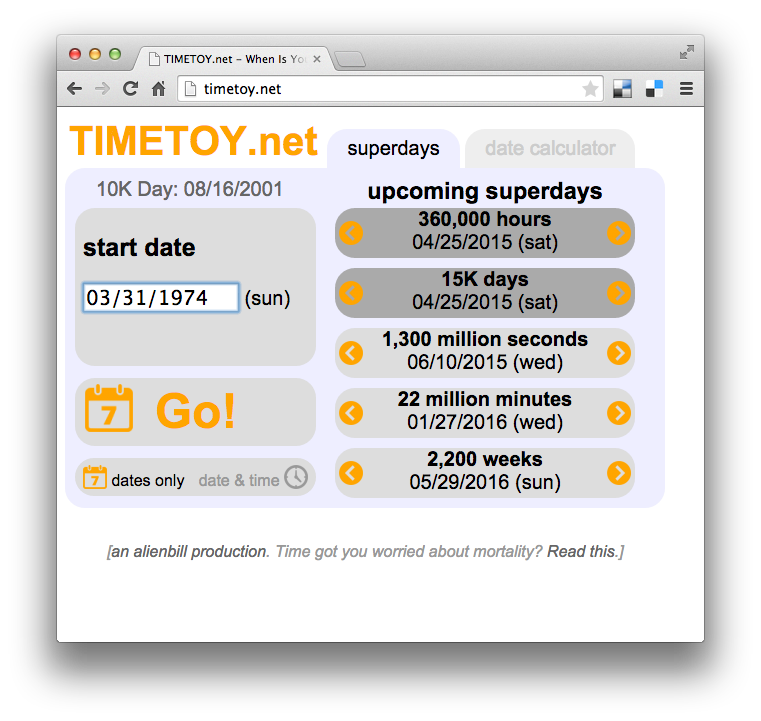 It's my 15K Day - I am 15,000 Days Old, exactly. First I had to figure out what milestones were "interesting"... eventually I realized it was powers of ten that happen rarely, but not TOO rarely... between 2-3 years. Later, I realized moving the widgets so the presented dates were in chronological order made more sense than any other arbitrary ordering. I know ideally it would check what the local separator character is, but this is ok for some hacks. Google is changing its algorithms (I think mostly just for people as they use mobile?) to favor mobile friendly sites. There's a useful tool page to see how mobile-friendly or unfriendly it considers your site. For a few months now, I've been appreciating Youtube's feature of playing back a video at 1.5x or 2x speed - it's great for almost anything but music, and I really miss it when I'm watching long TED-style speech heavy videos streamed from elsewhere. I used to go to the Settings widget and select the speed from the dropdown, but today I realized the greater than / less than signs get there just as well. As a person who has never regularly worn a watch, it's tough for me to gauge this. Does the Apple Watch have that same kind of value-add? My gut is saying no; our phones already staked out that space, and at the risk of being myopic to where this could go (in a "what people really want is a faster horse" sense) it's just a strap-on extra screen for your phone. 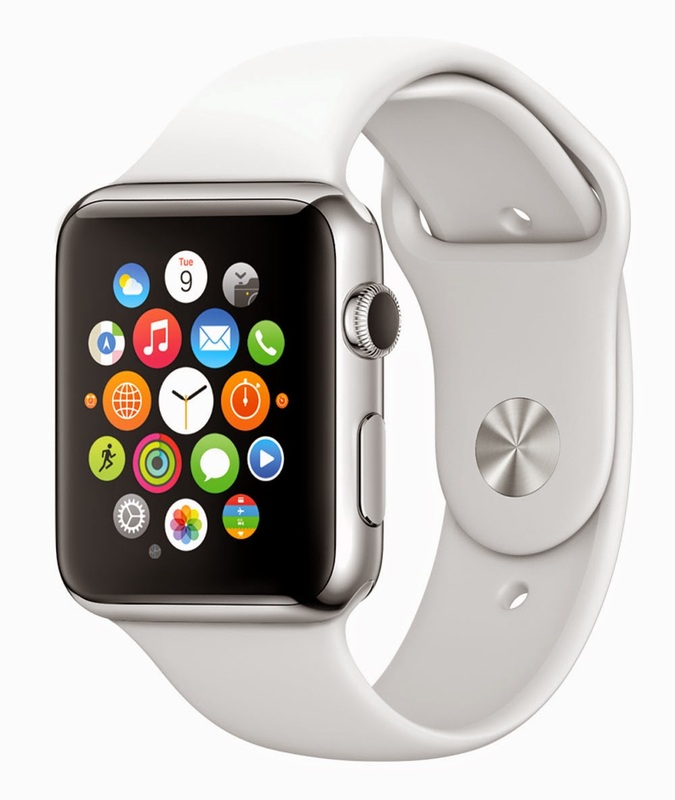 Gruber argues notifications aren't the biggest sell of the Apple Watch but I don't see it. What is the killer app for this thing? If it's notifications, stuff like Pebble argues that other watches could provide just that. Already there are some hybrids that some screen elements behind traditional physical watch hands. PROTIP: Most "powerusers" know about cmd-$ (i.e. shift-4) to grab a window screen shot (cmd-shift-3 for the (less useful) whole screen version). By default these get dumped to the Desktop... however, you can change the default screenshot folder. For a long while I wasn't a big fan of specialty folders, like "My Documents" or "My Music" on Windows. My preference was to put everything that made the computer special to me (save for the applications) into subfolders of "C:\data\" - that way I had one stop shopping for backup or moving to a different machine. "My Documents" was at some arbitrary place deep in the file system, and I didn't like all my "stuff" being so scattered, difficult to jump to in a DOS window. On Mac I've come around, however. For one thing, all of these folders are under my home directory, so are easy to get in Terminal - and the general Unix-y nature of "~/Downloads" appeals to me. I still rely more on Dropbox for media, however. Anyway, this is just a ramble talking about how I've found it better to embrace "Downloads" as a generic temporary file space, vs "Desktop". Saving Desktop for things I really want to be nagged about makes for a more pleasant and uncluttered desktop experience... the screenshot location was the last holdout, but now that's fixed for me. PROPROTIP: A final note about screenshots: after you do cmd-$, you can hit space to say "select a whole window" and then click to take the shot. By default this includes the gray shadow of the window. If you want a "cleaner" shot of just the windows itself, hold the option key when clicking. OSX has had some wonkiness with its window management buttons (the ones at the top right of each window) for a while. The green button was "zoom". I kind of liked this button, and its behavior of (more or less) "make this window take up the usable space on screen". The behavior was a bit wonky; browsers, especially Chrome, seemed to widen the screen to an arbitrary width (I was never sure if this had something to do with the content it was trying to display, or what) and not the full area. The result was people didn't like or trust the green button, because the results were wonky and hard to mentally model. Enter Hyperdock- a free (UPDATE - wrong, $10... I got confused by the licensing-- in the comments Jeremy suggests Spectacle has the same key-based window reshaping but is free) application that just adds a few subtle features to OSX. Most notably, Window Snapping. Personally I find "drag window to border to snap" to be difficult to wrangle, so I disable that, but now that I have cmd-option-arrow mapped, making windows hop around is literally a visceral pleasure. It does a great job making windows take up all the available space (or half the space, left and right arrows help setup half screen usage) leaving just enough room to see the dock and the menu bar. Perfect! Hyperdock has some other cool features - the signature feature might be how now hovering over a menu on the dock shows you thumbnails of all the open windows. Years ago I wrote how Windows Taskbar beats OSX Dock and I'm not sure I was wrong back then; the default of one icon per window (and task context, so to speak) still feels a little more logical than one icon per application. (Especially for people who use the Dock heavily as a program launcher, so their Dock has dozens of icons, only some of which are active... I tend to use the cmd-space spotlight launcher for everything) Anyway, this Hyperdock preview feature helps split the difference, and it's easier to remember than whatever wacky swipe or keypress shows me all my open windows. 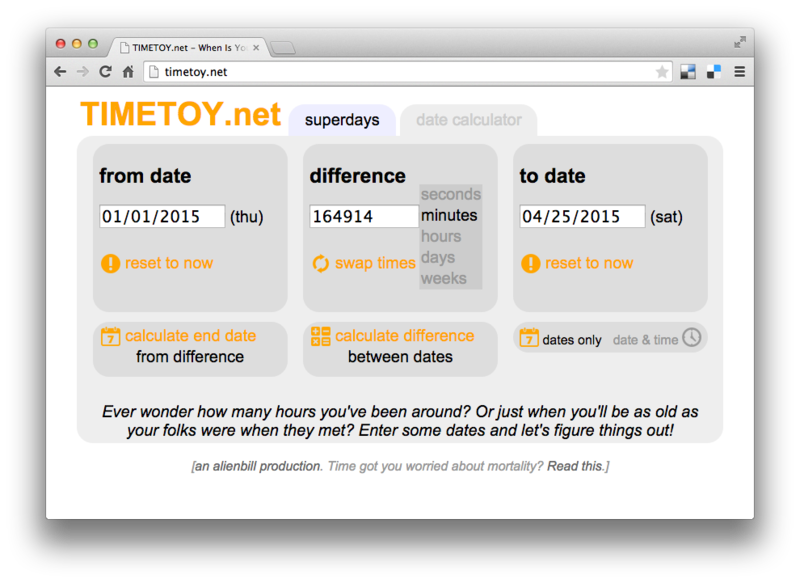 drag and drop scheduling p.o.c. 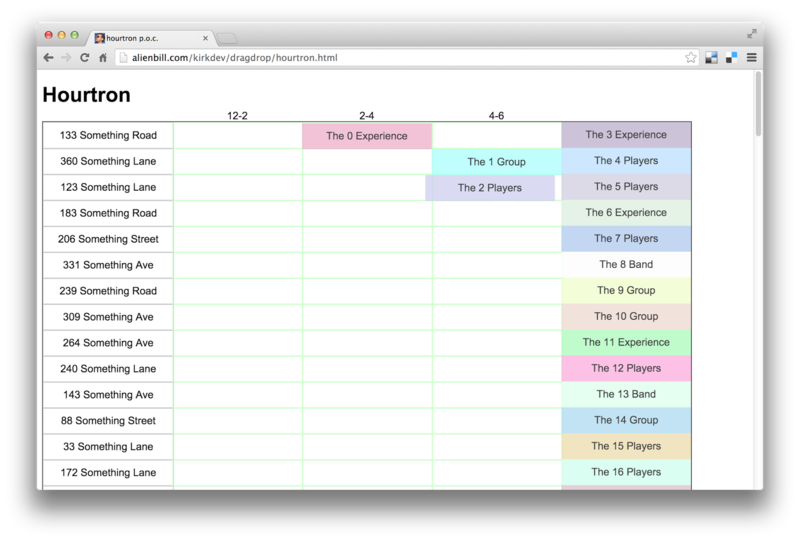 Continuing this as a Work in Progress, here's the first Proof of Concept of a Drag and Drop scheduler - stripped down enough to be a good snapshot to act as a foundation to build similar things in the future, without having to take out a lot of project-specific cruft.